Ares, God of War, is leading the other dying gods into battle. Which is just fine with Athena. She's ready to wage a war of her own, and she's never liked him anyway. If Athena is lucky, the winning gods will have their immortality restored. If not, at least she'll have killed the bloody lot of them, and she and Hermes can die in peace. Cassandra Weaver is a weapon of fate. The girl who kills gods. But all she wants is for the god she loved and lost to return to life. If she can't have that, then the other gods will burn, starting with his murderer, Aphrodite. The alliance between Cassandra and Athena is fragile. Cassandra suspects Athena lacks the will to truly kill her own family. And Athena fears that Cassandra's hate will get them ALL killed. The war takes them across the globe, searching for lost gods, old enemies, and Achilles, the greatest warrior the world has ever seen. As the struggle escalates, Athena and Cassandra must find a way to work together. Because if they can't, fates far worse than death await. "And what do they want?" "They want their weapon," she said. "They want Achilles found." "We won Cassandra," she said. "And we're closer to Achilles. Don't you see? The cards are falling our way. Wherever they are, the Moirae are with us. Fate favors us. That has to be true, Hermes. We have to have another chance." "I was thinking of..." she said, and stopped. She'd been thinking of touching Ares in the rainforest. The heat in her hands when she did it, and the feeling she got, when his blood burst under her fingers. Joy. Flat-out, powerful joy. There is no right place to start this review. Kendare Blake is a spectacular author that knows how to pull a reader in. Picking up a book written by this author is like opening the present that you have been dying to get. 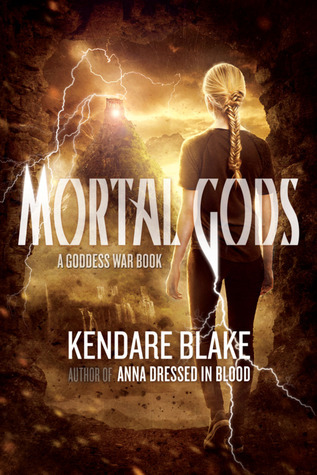 Kendare Blake and mythology... Well, lets just say that these books are in my hands as quickly as possible. Though I will admit that Mortal Gods got some of the second book syndrome, I will not deny that I enjoyed every minute of it regardless. Starting this book I thought it might take a bit to get into the swing of things, but it was smoother than I could have hoped for. Mortal Gods transitioned almost flawlessly from Antigoddess, even adding some intrigue to make it interesting right from the start. This being said it was still a little slow to start. Slow, but interesting. Does that make sense? Basically I was into it but wihed that everything would move a little quicker. This was very much a second book for me. It was pulling from the first book and setting the tone for the third. There was lots of great development but still many questions that were not answered. What really got me pulled back in was how well the gods parts were placed. Nothing like gods accepting or fighting their fate for their own reasons to pull me in. I really liked Cassandra in Antigoddess. There might be a but when it comes to this book though. It's still easy to admire her strength and love for her friends, but her need for revenge is changing her in ways that I'm not sure about. She wants her revenge and the cost does not seem to effect her, or at least in any way that she is willing to admit. She is basically willing to let everyone burn and disappear if it serves her purpose in the end. She is becoming a teenager with an attitude and a dangerous power along side it. I admire her strength and dedication but I'm disappointed with her behaviour. Athena, Hermes and the other gods/demigods/reincarnates are all developing in their own way too. There are so many conflicting feeling when I think of them all. It's not if they are good or bad, but more so why they have gone the way they have. I realize that they all fought for their own reasons before and host their own demons, but sometimes the things they do appear out of desperation. Athena seems to have her own reasons and yet they seem to always be in the best interest of her family. There are more dimensions added to Athena's character that made her easier to feel for. You start to get a better idea of what her motives truly are. You also get a better idea of where everyone's loyalties lay and why. Mortal Gods is the perfect second book. It pulls from Antigoddess and leads perfectly into the grand finale; Ungodly. It will never cease to amaze me the emotions that Blake can pull out with just one book. Admittedly I found disappointment in a character but am also willing to recognize that this is the path to something far better. However, there was also the introduction of characters that I really did enjoy and I guess that creates some balance. I look forward to picking up Ungodly and seeing how it all ends. If you have read Antigoddess I do recommend you read this because, heck Blake is epic. Even with the minor issues I had I believe that Ungodly will blow me away!! A must read series for fans of mythology. Open to US/CAN residents :) GOOD LUCK!